Where do you put this? There are a number of places that you can put it. The best option would be in the Alternate CSS file [I’m going to get around to posting this cause I haven’t found a great article explaining this to newcomers]. You could also just add it to the MasterPage but that’s not the cleanest method. After you hide 2 items you’ll get a space like this. Add the next line of CSS to tighten it up. Thx Thomas it worked great with SP2016 Feature Pack 1. 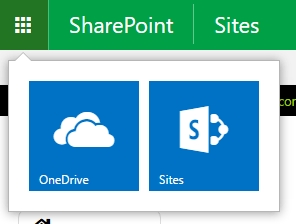 I added it to SP-Responsive-UI.css from (https://github.com/SharePoint/PnP-Tools/tree/master/Solutions/SharePoint.UI.Responsive) which is included in all pages without modifying the masterpage or using Alternate CSS file. How can I add more links to the top suite bar? Which master page file do I edit? Without inspecting I’d be guessing. Here is how it’s done and maybe you can figure out the selector for your buttons. Using the F12 tool bar I inspect the button. Look for the ID of the button as well use that in the CSS. 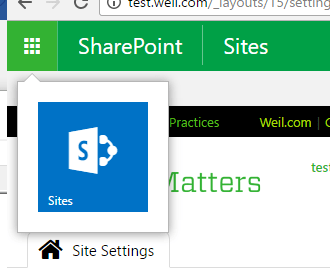 Below is the CSS you would use to change the background and hover color of the Delve button. 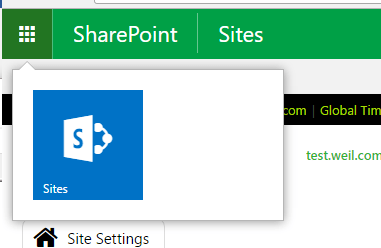 Will this also work with SharePoint 2016 on Prem? 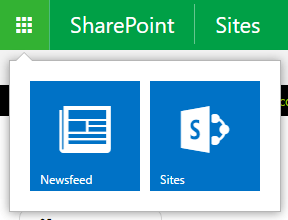 I’m rolling out our first ever SharePoint agency intranet – how exciting! I want to provide the “Sites” feature of My Sites, but hold off on OneDrive and Newsfeed until sometime later. Any advice you could provide would be super helpful! absolutely, the css “should be” the same for SP2016 as O365. Is there a way to disable this options by settings?